A wedding in the fields … It’s so romantic and peaceful! It’s quite inspiring to start your life as a happy newlywed. Here are our decorative suggestions to make yourself for a beautiful country wedding. For many women, marriage is one of the most important events in their lives and they would always like to remember it as the happiest day of their lives. This happy event that unites two people who love each other and who brings together the family and friends of the couple must be perfect from the beginning to the end! For that, an impeccable organization is necessary to guarantee a good atmosphere, a feast of king, memories full of the head but also and especially a very pretty decoration of marriage. A beautiful rural wedding decoration will take the bride and groom and the guests to fairy, it will take them out of their urban bubble the time of this extraordinary event where love is celebrated … As summer approaches or with the last rays of sun in autumn, many weddings take the theme fields because it is always more pleasant to get married with nice weather. The country theme is ideal to celebrate a wedding because you can make pretty pictures for your album and you can decorate your guest table as well as the entire ceremony. If you are about to organize a country wedding and need some more inspiration, our article is for you! The watering can symbolizes the countryside and use it as a flower pot and thus to divert it from its first utility is quite original and will be perfect for your country wedding decoration. Instead of putting flowers in a simple vase, putting them in a watering can will immediately think of the country theme! TIP 1: If you do not have one, buy steel watering cans, they will be more realistic than plastic watering cans and better fit the theme of authentic country wedding. Add beautiful bunches of flowers with large roses / peonies mixed with small flowers and foliage, freshly picked in the countryside, with even a few stalks of wheat here and there to mark your chic country wedding theme. Bohemia. TIP 2: You can also paint your watering cans in a shades of delicate colors! Arrange them on the floor with their bouquets, and here is your great country wedding decor has already started! For a beautiful country wedding decoration, which will attract even more the eye of your guests will be flowers and vegetation hanging from the trees around your ceremony, or the ceiling of your wedding hall. It can be hanging bouquets, be it a suspension in glass bottles or metal jars (painted or not to subtly recall your watering cans) for a pretty country wedding decoration. TIP: If you do not have one, you can buy large bottles of glasses at only 1.29 euros per unit at IKEA but you can also keep your bottles finished with olive oil, they will do very well. case. Put pretty flowers on it and hang a string around each bottle and hang them on the trees in the garden or nails in your party room! This DIY is reminiscent of the one we told you at the end of our article on indoor plants when we do not have the green thumb so do not hesitate to reproduce it! At these suspensions, it can be really nice to add garlands of flowers and ivy. Outside, if you have a lot of vegetation, it is not necessary. However in your party room, this will make the link between the hanging bouquets, accentuate the atmosphere and add LED garlands that will be lit at night, for a magical effect in your home decor. country wedding. The glass jars will immediately recall the theme of rural wedding so they will be perfect for your guests to use the punch or any other drink your choice! TIP: You can buy glass jars at 6.99 euros each on http://www.feter-recevoir.com. Pour the drinks of your choice (punch, lemonade, cocktail of your invention …) so that guests can serve themselves! You can also write the name of drinks on thin sheets of natural wood. DIY 4: What deco table to choose for a country wedding? Prefer wooden chairs or benches, but if you have for example a tent set in the middle of the fields and you find that the style of rural wedding decoration is already present, opt for lambda chairs or Napoleon style chairs for the side bohemian but chic! Put crystal glasses for wine and why not pink or lavender water glasses. What’s better for you and your guests than a photocall in the theme of your country wedding decor! Your photographer will only have to immortalize these moments of complicity. DIY 6: the little details that change everything for your bohemian chic country wedding decoration! There are small details that will immediately set the tone of this chic country atmosphere that you want to create for this particular day. A beautiful round table with lanterns and a floral table center for guests to put your gifts and especially put on the table a nice old trunk in which they can drop their envelopes. A plan of tables at the entrance of your party room: use a pallet placed vertically and hang a fence on it, then you fix with the help of small clothespins table names and guests. On the tables, apples of bread or small wooden logs in which the names of your guests are inserted for the placement of each one. that everyone is in family and friends around a moment of creativity and relaxation between the town hall and dinner for example! 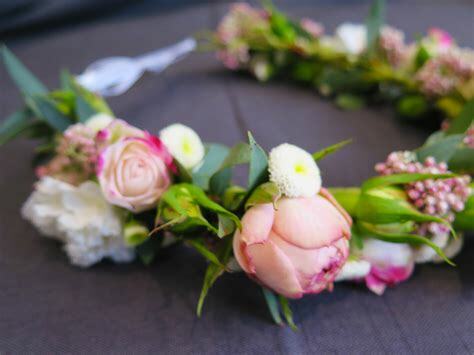 TIP: This DIY video tells you how to make your flower crown for your country wedding decor!